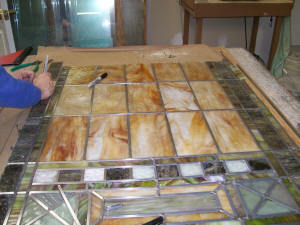 If you want your church stained glass windows to stand the test of time, they will require periodic maintenance. This could include installing new lead caming, waterproofing, broken glass repair, repairs to painted art work and addition of zinc coated steel bars for reinforcement. 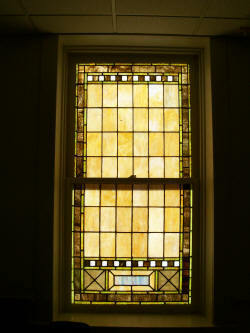 Church stained glass windows can be removed and repaired then reinstalled. Some possible signs of age that are observed are deteriorated lead (brittle) and broken solder joints. 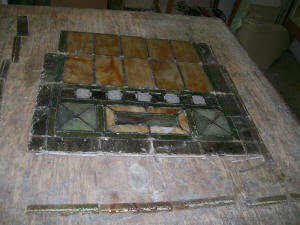 Dried out glazing putty has begun to fall out of the lead caming. Loose reinforcement bars that have separated from the stained glass window. A stained glass window has begun to buckle and appear wavy. A stained glass window has many broken or missing pieces. A stained glass window has painted faces that appear to be faded. If you would like a professional to look at your church stained glass windows for restoration, please call us or fill out the form on our contact us page.